Alunaria is so sweet! She gave everyone who participated in her “Happy Thoughts” project over the holidays a Cap’n Crackers! In consequence of this unexpected and generous gift, Kerithian is my first Alliance character to break level 110. She did some of the Druid Order Hall Campaign and some questing in Val’sharah to get to level 111 so that she could wear the Kul Tiras belt that I wanted to use for this outfit. Thank you! It was fun to put together, and definitely worth the effort of spending an evening questing so that I could use that belt. ahh she looks fantastic! Such a cutie pet, too. Congrats! That shot is my favorite of the set, too! Thank you again for a lovely gift! Good tmog to go with that bird. 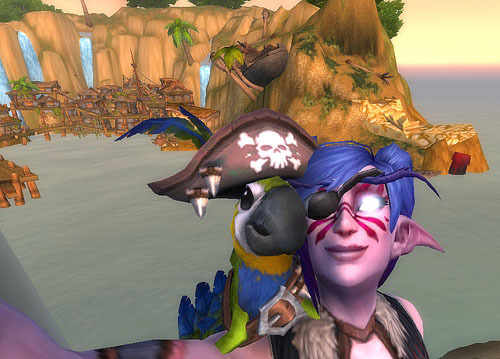 Captain Crackers is really a very nice pet I would have never known about the shoulder perch, thanks to Alunaria! I’m loving mine, perched there through all the fighting and even swimming too I think hehe.